Before we start making our sliding door, I'm sure you would like to know a bit about SliderJoint2D. If you have worked on the Box2D physics earlier, then the word Prismatic Joint might sound familiar to you. The prismatic joint there in Box2d is our SliderJoint2D in Unity. SliderJoint2D, as the name suggests is useful when you want to add a linear movement between two bodies, where one of them would be fixed and the other moving. The moving part is generally called the slider and the body to which this slider is connected to is called the connected body. If you would want to setup a scene just like I am doing here follow the steps below or you are just here to read how this SliderJoint2D is used so that you can use it in your game to create a sliding door or for some other thing, you can simply read on. 1. Create a New project in 2D mode, add a New Scene and name it anything you like to name it as, I'm going to name it as Sliding Door. 2. Download the sprites from the rar file here and add them to your project folder. NOTE: Make sure the images are imported as sprites and not as textures. 3. Drag and drop the Wall sprite onto the Hierarchy of the scene. This should create a new Object of the same name. Rename the object to LeftWall. In the Inspector, you would see a transform and a Sprite Renderer component for this newly created object. Position this Wall at (-8, 0, 0). Set the Scale to (3, 1.5, 1). 4. Duplicate the object above and name it as RightWall. Position this object at (8, 0, 0). 5. It is time add the door to our scene. How would a Sliding Door scene be complete without the door? :D That was pretty lame, but yeah... Drag and drop the door from the Sprites folder you downloaded and added under your project's Assets folder. 6. Position it at (0, 0, 0). Set the Scale of the door to (2, 1, 1). 7. Add a Rigidbody2D component to this door by clicking on Add Component button in the Inspector panel and simply search for Rigidbody2D. 8. After you successfully add the Rigidbody2D component it is time to add the SliderJoint2D component. Repeat the same procedure as above, but here you would search for SliderJoint2D component instead. 9. Position the Main Camera at (0, 0, -10). - We uncheck the Collide Connected checkbox as we do not want the door sprite to collide with the wall. The Connected Rigidbody field will be empty as a result. - The Ring which you see when you double click on the Door object in the Hierarchy, indicates the Anchor point, while the filled circle indicates the Connected Anchor. - If you configure the SliderJoint2D as above, you will notice that the Filled Circle resides inside the Ring and are present at the left end of the door. - You should also notice that there are two vertical green lines at both ends of the door. These lines signify the range that our door slides through. The Translation Limits is the field which defines these green lines. Shifting the anchor point will shift the movement range. Play with it to get a understanding of how it works. - Since we will be using the motor to slide the door, we have enabled it. We will be modifying the Motor Force via script. //we will use the jointMotor2D to add speed and later set it back to the SliderJoint2D's motor as setting the motor speed of the sliderJoint2D doesn't work. 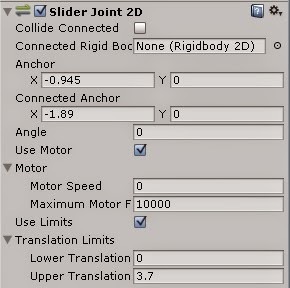 You can change the Slide Speed field of the SliderJoint Script in the Hierarchy to alter the speed. The post is nicely written. Great job you have done. Thank you for posting this blog here. I will definitely share this post at https://palmaluminum.com.